In 1500 AD, the Inuit weren’t doing so well. They had been buying steel and iron weapons from Vikings and East Asian traders. They used their good weapons to hunt whales, and they lived on whale meat and built houses of whalebone. That was still working in Alaska. But in Greenland, the Vikings had lost interest and stopped trading. Now that they couldn’t hunt whales anymore, the Inuit had a hard time getting enough food in the Arctic. Inuit in eastern Canada and Greenland were poor and struggling. Now in 1530 AD more Europeans arrived, but not to trade. Basque men came first from Spain. They built little forts along the coast of Labrador to fish and hunt whales. Inuit people didn’t try to stop the Basque men, but they did raid their forts to get tools, especially iron tools, for themselves. Then Martin Frobisher and John Davis came from Britain in the 1570s and 1580s. They sailed around the Arctic looking for what they called the “Northwest passage”. They were trying to find a way to sail from Greenland to Alaska by boat. Then Europeans could ship things from Europe to China without having to travel all the way around Africa and India. Inuit people met with these men. They told the men they didn’t know any Northwest Passage (because there isn’t one). Frobisher took one Inuk man back to England with him, just to visit. By 1600, the Basque sailors had stopped coming to Labrador, probably because the whales had also stopped coming there. But the Inuit still met occasional French and English explorers and traders. They caught many serious diseases from these French and English visitors. Many people died of smallpox, measles, tuberculosis, and other sicknesses. On the other side of the Americas, in Alaska, Inuit people were still trading with people in Siberia, selling furs and buying metal tools and buckles. 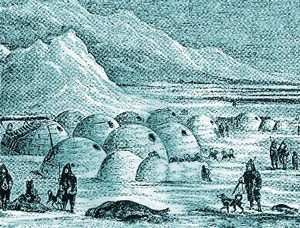 Gradually more European and Central Asian people came to visit Inuit villages. Some of them stayed to show that the Russians or the Canadians or the United States government ruled the Arctic. In 1766, Catherine the Great sent Russian explorers and settlers to Alaska. She claimed Alaska as part of Russia. Europeans didn’t like that! So in the late 1700s, Protestant missionaries from Europe came and converted many Inuit people to Protestant Christianity. These missionaries also gave people lots of iron tools like sewing needles and knives that were very useful to them. Russia, the United States, and Britain competed for control of Inuit land. So more and more explorers came to Alaska and northern Canada. Finally in 1867, the Russian Czar Alexander sold Alaska to the United States (as if it were really his and didn’t belong to the Inuit!). About 1940, Canadian people developed good enough airplanes and helicopters to be able to visit Inuit territory even in the wintertime. Now the Canadians interfered more with the lives of Inuit people. 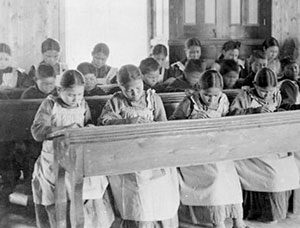 Canadians forced Inuit kids to go away to terrible boarding schools, saying they would learn Canadian ways of doing things. They forced grown-up Inuits to settle down in towns instead of being nomads. At the same time, Canadian doctors and nurses saved many Inuit babies and children who would have died. So there got to be many more people living in Inuit territory than there had been before. There were too many to feed by traditional hunting and gathering and fishing. Many Inuit became poor and angry. But in the 1960s kids in the boarding schools made friends with each other. 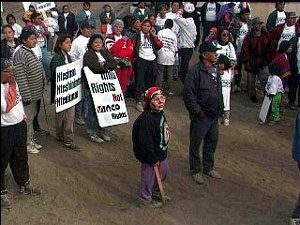 They decided to fight for better treatment for their people. When they grew up, they went back to their families and insisted that Inuit people should be treated by Inuit doctors and nurses, and have Inuit policemen and government in their towns. Cite this page: Carr, K.E. The Inuit and Canadian history. Quatr.us Study Guides, August 13, 2017. Web. April 26, 2019. Thanks for your input, Soha! I’ve made some changes to the article, hoping to address your concerns. I agree that this was a little too light-hearted about the boarding schools. I didn’t want to frighten kids reading it, but I’ve tried to clarify now. There are a number of problems with this article. However, first and foremost, you really need to look at the impacts of residential school on Inuit as well as on First Nations and Metis in Canada. Your depiction is highly generalized and to be honest superficial. For further information you should really look at the materials made public by the Truth and Reconciliation Commission and the National Centre for Truth and Reconciliation. Also, Inuit (pl) means ‘the people’. Inuk is the singular. Also, Inuit towns are municipalities and have majors, not governors.